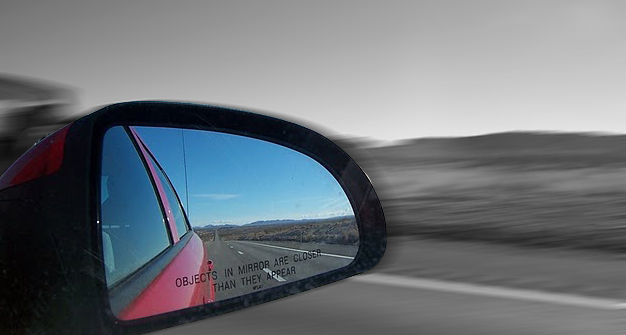 The rear view mirror is used to see the things we left behind, if we look at it in our lives we can see the objects in the mirror as the Past, and the past always looks to be closer in our lives than it is. Most of us still live in the past, and because we are thinking about the past, we can’t live in the present moment, which is the most important thing in our lives. We all come to the place we are now because of the decisions we have taken in the past and because of the moments we lived before this one, but the past does not really exist now, the only thing that exists is the present, the past is like a movie in our minds, you can see it,but you can’t touch it, or change it. When we live regreting the things we did in the past, the decisions that hurt others or that were painful for us, then we can’t see the most important gift we have in our lives; the Present. “God did not gave us life when we were concibed, God gives us the gift of life in every breath we take. Inside of our minds the past always looks closer than it is, it looks closer , because we want it to be that way, when we stop feeding our mind with thoughts of the past and just start being, then the past can work for us in order to learn from that movie, knowing that we can’t change it. Instead if we learn from the past we can change the future, which eventually will become The Present. *Victor Frankl was an Holocaust surviver, he wrote the book Man in Search of Meaning and developed the Logotheraphy, which is considered “the Third Viennese School of Psychology” it is based on the premise that the primary motivational force of an individual is to find a meaning in life. All of these resolutions have something in common. They focus on the body or the mind. But what about spirit? What about being a better human being? This year I have a proposal that could change the way you live your life by only focusing on one single thing. To decrease the times you get angry during this year. Besides of all these benefits, this resolution, even though it does not seem easy at the beginning, is very simple. Even if you get mad during the year, it does not mean you missed your goal. You simply want to decrease the times you get mad. So every time you don’t get mad, you achieve your goal. At the end of next year you will be by far better than you were at the beginning of the year. You can also have other physical goals too. In fact, decreasing the times you get angry will help you to reach those goals– every time you fall short, you will not get mad at yourself, but you will learn about it, stand up and try it again. Every step you take will make you better. And with every step you will get closer to God and his ultimate Peace. God Bless you this year.